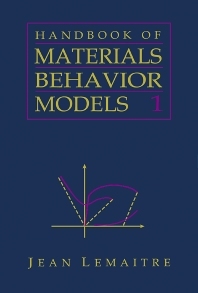 This first of a kind reference/handbook deals with nonlinear models and properties of material. In the study the behavior of materials' phenomena no unique laws exist. Therefore, researchers often turn to models to determine the properties of materials. This will be the first book to bring together such a comprehensive collection of these models. The Handbook deals with all solid materials, and is organized first by phenomena. Most of the materials models presented in an applications-oriented fashion, less descriptive and more practitioner-geared, making it useful in the daily working activities of professionals. The Handbook is divided into three volumes. Volume I, Deformation of Materials, introduces general methodologies in the art of modeling, in choosing materials, and in the "so-called" size effect. Chapters 2-5 deal respectively with elasticity and viscoelasticity, yield limit, plasticity, and visco-plasticity. Volume II, Failures in Materials, provides models on such concerns as continuous damage, cracking and fracture, and friction wear. Volume III, Multiphysics Behavior, deals with multiphysics coupled behaviors. Chapter's 10 and 11 are devoted to special classes of materials (composites, biomaterials, and geomaterials). The different sections within each chapter describe one model each with its domain of validity, its background, its formulation, the identification of material parameters for as many materials as possible, and advice on how to implement or use the model. The study of the behavior of materials, especially solids, is related to hundreds of areas in engineering design and control. Predicting how a material will perform under various conditions is essential to determining the optimal performance of machines and vehicles and the structural integrity of buildings, as well as safety issues. Such practical examples would be how various new materials, such as those used in new airplane hulls, react to heat or cold or sudden temperature changes, or how new building materials hold up under extreme earthquake conditions. Mechanical engineering and mechanics; Libraries (academic and industrial); working groups in mechanics of materials, computational mechanics and engineering design and control.